St. Mary’s Center Preschool has served Oakland families facing severe hardship for nearly 40 years. The center provides a safe place for children to learn and play in the middle of one of Oakland’s poorest neighborhoods. 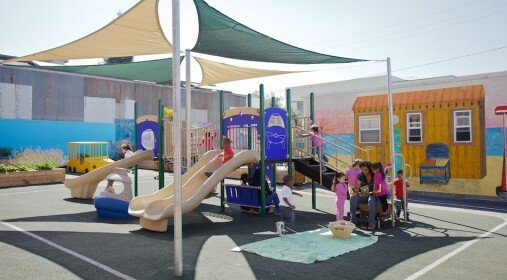 LIIF’s Alameda County Child Care Facilities Fund, supported by First 5 Alameda, provided a $50,000, two-year grant to St. Mary’s to completely revamp its outdoor play space. The new yard includes a garden to grow fruits and vegetables for snacks and to teach children about growing plants and healthy eating.